If your cat has taken to urinating outside the litter box, it can be difficult to remove and nearly impossible to mask. 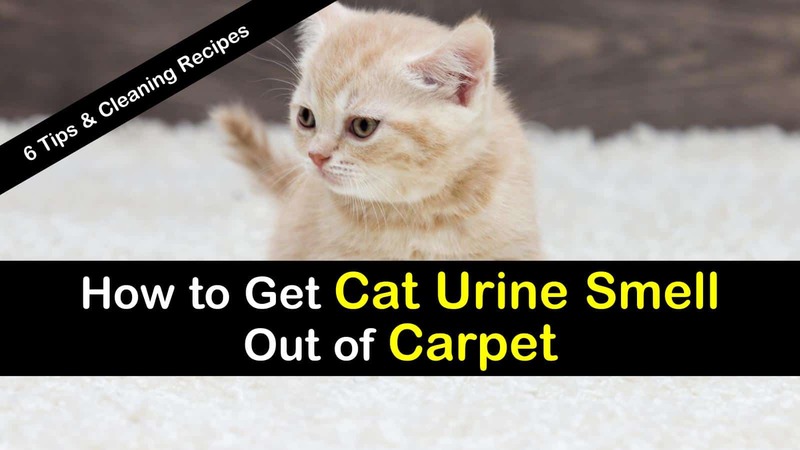 Of all the stains that can mar your carpet, urine, both cat, and dog, is one of the most difficult ones to tackle. To prevent your cat from continuing to use your carpet as their litter box, it is crucial to neutralize the odor as quickly as you discover the accident. Regardless of when the accident happened, with a little know-how and some elbow grease, you can tackle the stain and eliminate the odor left by your furry friend. 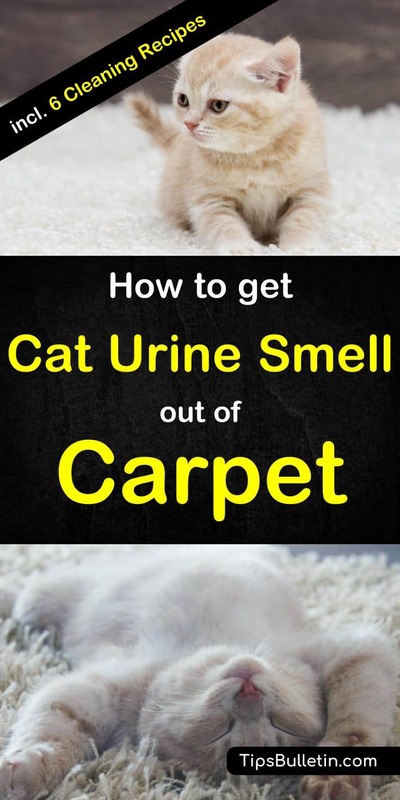 Here are six tips on how to get cat urine smell out of the carpet. Cleaning up cat and dog urine on your carpet or upholstery can be a challenge. There are numerous commercial products on the market, like Nature’s Miracle that can help you treat pet urine. You can also make a homemade carpet stain remover with inexpensive everyday products that you already have in your home. Cat urine isn’t all that different from the pee of other animals. The problem becomes when it goes unnoticed, allowing the bacterium that is found in the urine to begin to decompose, resulting in the strong ammonia-like odor that is characteristic of stale, old urine. That’s why it’s so important to clean the stain as soon as you discover it. If you don’t catch your furry friend in the act of marking their territory, you may not know they’ve had an accident until the urine odor begins to take over your house. To locate the old stain, start where the smell odor is strongest, gradually moving farther away from the general area. Just as we already discussed in our post on how to get urine smell out of mattress, older pet urine stains will appear yellow or greenish in color. You can also try using ultraviolet light to help you locate the stains. After you’ve located an old urine stain, you can use an enzyme cleaner to remove the stain and offending odor. An enzymatic cleaner uses natural enzymes and some species of bacteria to break down the crystals of the urine and eliminate the odor. One of the best ways to get the urine smell out of carpet is by using an enzyme cleaner. There are several on the market that work well, but if you are on a budget, they can be fairly expensive. With a few simple ingredients, you can make a DIY enzyme cleaner to tackle even the oldest pet stains. The only caveat with this method is that you have to allow it to ferment for three months. In a 2-liter plastic bottle, add all the ingredients. Place the lid back the container and give it a good shake. Loosen the cap to allow the gases to escape. After three months, you’ll have a concentrated solution. To use on pet stains, add ½ cup of the enzyme cleaning concentrate to a spray bottle and fill with a liter of water. Liberally spray the affected area and let stand for several minutes. Blot dry with a paper towel or clean cloth. Another great way to get rid of old pet stains is by using the process of oxidation. As you can see on our tips for DIY carpet cleaning solutions, products that release oxygen, like baking soda, are effective at removing odors. Combining the hundreds of uses for baking soda and vinegar will help to remove the stain and eliminate the smell of urine. Combining baking soda and vinegar will create a stain-fighting solution that will be hard to beat. The vinegar will break down even the oldest stains and kill the bacteria that causes the odor, along with the baking soda. The baking soda oxidizes the area, lifting the stain, and absorbing odors. This organic cleaner recipe is a slight variation of our mixture on the how to get blood out of carpet tips. In a spray bottle, mix the vinegar and water. Liberally spray the stained area with the solution of water and vinegar. Sprinkle enough baking soda over the stain to thinly coat the area. Cover the stain with a clean towel and let sit for 24 hours. Then, thoroughly wash the area with cold water. As you see, basic home remedies like baking soda and white vinegar are such versatile household cleaners. Especially simple diluted white vinegar is such a powerful natural cleaning solution. It is just one of the many amazing vinegar uses around the house. When dealing with new stains left by your pet, the best way for how to get dog pee smell out of carpet or cleaning upholstery is by treating the area immediately. The first thing that you need to do is use wet paper towels or cloth to absorb fresh puddles pee. Layer the towels over the liquid and place a weight of some kind onto the towels. The moisture in the towels, along with the weight, helps to soak up the urine. Leave the towels over the area for at least ten minutes. After thoroughly blotting the area to soak up any excess liquid, you’ll want to treat the stain with baking soda and hydrogen peroxide. Hydrogen peroxide may change the color of your carpet, so it is best to test this method in an inconspicuous area before applying to the pet stain. One of the many great hydrogen peroxide uses around the house. It is often used as a disinfectant and antiseptic, but it is also great for removing stubborn pet stains from your carpet. It is fairly inexpensive, making it a cheap alternative to the commercial pet stain removal products. Combine the hydrogen peroxide, baking soda, and dish soap in a spray bottle. Shake well to ensure the ingredients are combined. Spray this DIY carpet stain remover liberally on the stain and allow to air dry. Once dry, vacuum up any remaining residue. Once you’ve spent the time to clean up any new and old pet stains, the last thing you want to do is have to go through the motions again. While there are no guarantees that your pet won’t ever have another accident, you can use a natural, homemade solution to deter them from marking the same spot. Rosemary essential oil is a natural ingredient that will keep pets from marking the same spot that you just finished cleaning. This spot treatment spray will deter your pets from re-staining your carpet. Melt a bar of castile soap, then add the rubbing alcohol and rosemary essential oil to the mixture. Let the ingredients cool. Pour into a spray bottle. Spray the area and let dry. We love our pets. What we don’t love are the messes they sometimes make and the accidents that leave our carpet stained and smelling like urine. Spot treating the area with simple cleaners and everyday products will help to remove the stain and eliminate the dog urine smell that permeates the area. We hope you found this article useful and will use these tips and recipes when cleaning up your pet’s messes. If you found this information helpful, please feel free to share this article with all your friends and family.